Ron Arad has a history of bending steel to fit his needs – in 1986 he did it for a chair and now he’s gone even further and bent sheets of steel into such a tizzy they now forms two functional bike tires. 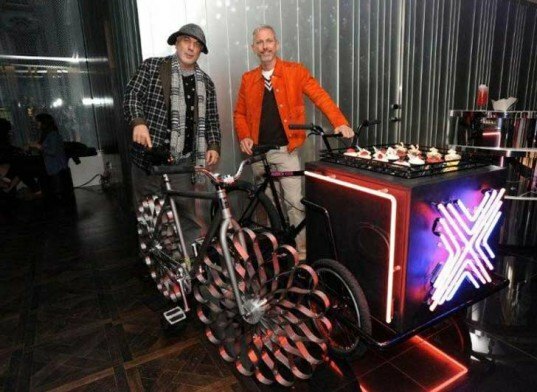 The bike was designed specifically for W Hotels and was just revealed at an event in London. For the next two weeks guests at the W Hotel in London can take the flowery prototype for a spin. Soon, as part of a fundraiser for the Elton John AIDS Foundation, this bike will be auctioned off to one lucky cyclist along with other custom designed and constructed “WOW bikes”. Tempered steel has a bounce to it that allows the wheels to have a bit of spring, they’re also a bit larger than regular bike tires so that the spring is palpable for the rider. Arad’s studio says the ride is pretty smooth — despite the gap in the tires design — and the faster you go the better it feels. 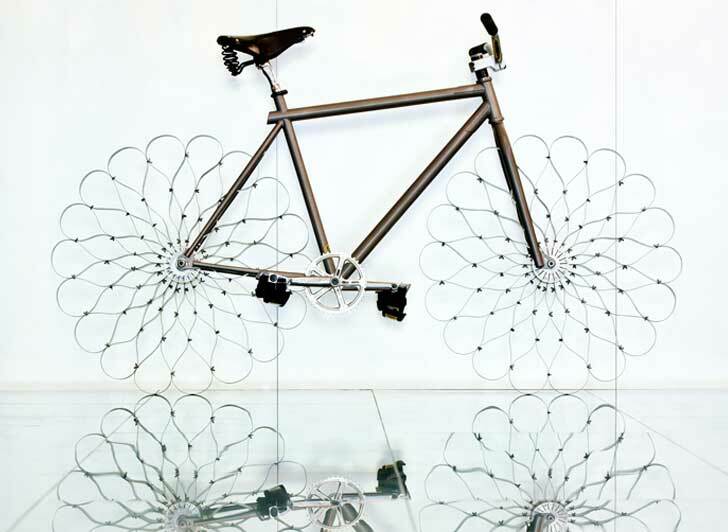 According to Fast Company Design the bike was built in just two weeks and uses eighteen steel strips that are fastened together at symmetrical points. We’ve got to say, though the other bikes in the auction would be just fine for a ride around town, Arad’s design stands out from the crowd. We’re envious of the lucky auction goer who can put up the — most likely — very high price tag for this beauty. how about a video of someone riding this fascinating bike? Although it may have a SMOOTH bounce 2 the ride it seems that there would be no grip 2 the road. And the wheels will be all over the place. I feel sorry for the person that has 2 stop suddenly, because a SUDDEN stop looks like 2 be probably 100 feet from the breaking point. Ron Arad has a history of bending steel to fit his needs - in 1986 he did it for a chair and now he's gone even further and bent sheets of steel into such a tizzy they now forms two functional bike tires. The bike was designed specifically for W Hotels and was just revealed at an event in London. For the next two weeks guests at the W Hotel in London can take the flowery prototype for a spin. Soon, as part of a fundraiser for the Elton John AIDS Foundation, this bike will be auctioned off to one lucky cyclist along with other custom designed and constructed "WOW bikes".